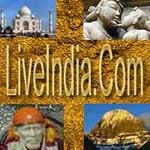 "India's Luxury lies among it's landscape, colour, people, traditions and it's extraordinary service. It is a country accustomed to pampering". You will find this country overflowing with people willing to serve at a very small cost and will do it with a smile and good grace. The very heart of the world's largest democracy, New Delhi is quite naturally the focus of all India. The nerve centre is undoubtedly Parliament house (Sansad Bhavan). This vast, circular, colonnade-rimmed architectural landmark was built by Herbert Baker, who, along with Edwin Lutyens, was responsible for constructing most of the British Delhi. Location : 14 kms. from Airport; 12 kms. from Railway Station. Banquet & Conference : Hall - 14. Cuisine : Indian, Chinese, Continental, French. Hotel Shangri-La is the newest state-of-the-art business and leisure hotel in New Delhi, managed by Shangri-La Hotels and Resorts Pvt. Ltd. It is contemporary and stylish in Oriental design and there are beautiful landscaped gardens, with superb recreational and business facilities. Location : Located in landscaped gardens in the historic government district and overlooking Connaught Place and the major shopping and business centres of the city. Cuisine : Indian, Mediterranean, Oriental and Italian. Dining : The Uno 2 Go, 19 Oriental Avenue, Café Uno, Pan Asian Restaurant, Island Bar and the Lounge cater to every gastronomes palate in style. Other Facilities : health club and spa, swimming pools, high-speed Internet accessibility etc. Address : 19, Ashoka Road, Connaught Place, New Delhi 110 001, India. A graceful 12-story hotel constructed of pink Dholpur sand-stone and set in landscaped gardens, the hotel is centrally located and a few minutes away from the Janpath shopping area and city centre and boasts of spacious guest rooms with panoramic views - each with purified drinking water, direct-dial phone, colour TV with in-house movies. Gracious atmosphere and hospitality, with all modern convenience. Location : 22 kms. from International Airport, 8 kms. from New Delhi Railway Station. Cuisine : Indian, Chinese, Continental, Coffee Shop. Other Facilities : Tea/Coffee maker, Electronic Safe, Valet Service, Data ports / ISDN, Onference & Banquet facilities, Swimming Pool, Business Center, Discotheque. Address : No.1, Man Singh Road, New Delhi - 110 011. The Grand New Delhi that rises high above the city streets but remains within easy reach of the main business district and tourist attractions. Inside, visitors will find the best of India: rich decor, superb cuisine and above all, faultless service. Location : 23 km. from International Airport, 16 km. from Domestic Airport, 2 kms. from Railway Station. Cuisine : Thai, Continental, Chinese, Indian. Dining : Restaurants - 7, Bar - 1. Other Facilities : Room Service, H/C running water, Internet surfing in rooms, Fax on application, T.V. Channel Music, Weighing Scales, Safe Deposit in Some Rooms, Direct Dialing STD/ISD facility, Business Centre, Separate Executive Floor, Club Lounge, Banquet & Conference Facilities, Beauty Parlour, Shopping Arcade, Health Club, Swimming Pool, Discotheque. Address : Barakhamba Avenue, Connaught Place, New Delhi - 110 001. In the heart of New Delhi, one of the cities representing the ancient civilization of India, Hyatt offers a serene refuge of comfort and hospitality where Indian tradition and modernity are blended. An impressive local landmark hewn from the native sandstone of the area, Hyatt Regency Delhi is a palatial complex that offers travellers a heightened level of luxury, accommodation, dining, entertainment and travel services. Location : 15 kms. from Airport, 10 kms. from Railway Station. Cuisine : Indian, Continental, Italian, Oriental, Middle Eastern. Other Facilities : 24 hrs. Room Service, H/C running water, Telephone, Satellite T.V, Safe Deposit, Channel Music, Mini Bar, Dataport, Non-smoking rooms, Business Centre, Separate Executive Floor, Executive Lounge, 24 hrs. Cafe, Banquet & Conference Facilities, Health Club, Swimming Pool, Tennis, FunPub, Shopping Arcade, Flowershop. Address : Bhikaji Cama Place, Ring Road, New Delhi - 110 066. Our goal at Le Meridien is to provide our guests with a truly exceptional experience in each of our hotels. As one of the leading hotel brands in the world, we offer a unique European experience with French flair throughout our 140 luxury hotels in 55 countries. Location : 18 kms. from Airport, 2 kms. from Railway Station. Banquet & Conference : Hall - 6. Other Facilities : Room Service, H/C running water, Telephone, T.V., Channel Music, Business Centre, Separate Executive Floor, Executive Lounge, Banquet & Conference Facilities, Beauty Parlour, Shopping Arcade, Health Club, Swimming Pool, Tennis, Disco. Address : Windsor Place, Janpath, New Delhi - 110 001. With its distinctive architecture & superior facilities, the Maurya Sheraton Hotel and Towers is a landmark in this sprawling capital city. 500 luxury rooms and suites, including the TOWERS sets apart a block of exclusive floors, represent an entirly new genre in the art executive hospitality, sit-in, check-in facility, the Towers Club & Library Bar create a perfect ambience for the business travellers. Location : 10 kms. from I.G.I. Airport, 8 kms. from New Delhi Railway Station. Cuisine : Indian, Chinese, Western. Other Facilities : Digital room Safe, Butler service, Air relaxing chair in room internel, X-copier, Fax, C.D. system, Tea-coffee, Stepper, Solar - Heated Pool, Health Club, Yoga Centre, Tennis, Disco, Astrologer, 2 Library Bars, Golf/Polo/Squash/Bowling on request. Address : Diplomatic Enclave, S.P Marg, New Delhi - 110 021. 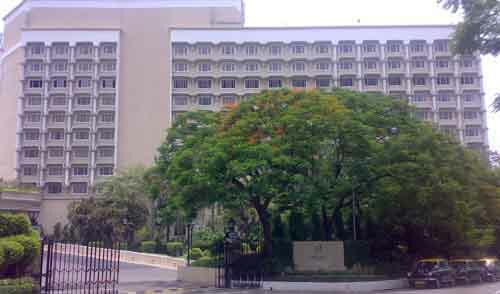 The Park Delhi is situated in the heart of the capital of India. Location : 18 kms. from I.G.I. Airport, 2 kms from New Delhi Railway Station. Other Facilities : Tea - Coffee maker, Room safe, VCD, Fax, Internet, Swimming pool, 24 hours coffee shop, Bar, Mini bar in all rooms, Discotheque, Conference facilities etc. Address : 15, Parliament Street, New Delhi - 110 001. 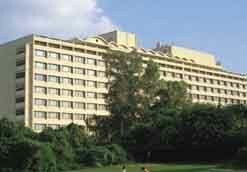 Deluxe hotel, centrally located and overlooking the prestigious 18-hole Delhi Golf Club. Location : 22 kms. from I.G.I Airport, 10 kms. from New Delhi Railway Station. Cuisine : Continental, Thai, quintessentially Indian, Szechwan, Cantonese. Other Facilities : Fully equipped 24-hour Executive Centre, Banquet Facilities & Conference Facilities, Beauty Parlour, Shopping Arcade, Oberoi Spa & Fitness Centre by Banyan Tree, Swimming Pool. Address : Dr. Zakir Hussain Road, New Delhi - 110 003. The world of Jaypee Hotels is essentially based on personalised service combined with the most efficient levels in the hospitality industry in India. Location : 6 kms. from Domestic & 12 kms. from International Airport, 14 kms. from Railway Station. Other Facilities : 24 hrs Room Service, H/C running water, Direct dial telephone, Fax on demand, Satellite TV, Multi channel Music, Safe deposit lockers, Hair Dryer, Mini Fridge, Valet Service, Business Centre, Banquet & Conference Facilities, Shopping Arcade, Travel Counter, Car Parking, Outdoor Swimming Pool Health & Fitness centre with Beauty Parlour & Barber Shop. Address : Vasant Vihar, New Delhi - 110 057. No hotel symbolism the traditional grandeur and hospitality of the historic capital of India more than the Ashok, the foremost of Delhi's 5-star hotels and the flagship of the Ashok Group. 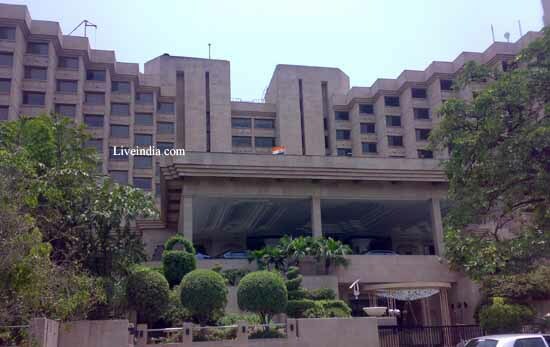 Set in a prime location of Delhi's diplomatic enclave, the Ashok is a familiar and distinctive landmark, its rose-pink walls and arched and turretted contours setting it apart from the glass and concrete conformity of other hotels. Location : 15 kms. from IGI Airport & 12 kms. from Domestic Airport, 9 kms. from New Delhi Railway Station. Cuisine : Indian, Continental, Chinese, Japanese, French. Dining : Restaurants - 6, Bar - 5. Other Facilities : Broad Band Internet Connection, Room Service, H/C running water, Telephone, T.V., Channel Music, Business Centre, Separate Executive Floor with Executive Lounge, Banquet & Conference Facilities, Beauty Parlour, Shopping Arcade, Health Club, Swimming Pool, Tennis, Golf, Billiards room, Airlines Counter, Travel & Tours, Barber shop, Confectionary, Courier service. Address : 50-B, Chanakyapuri, New Delhi - 110 021. The Crowne Plaza, a five-star deluxe hotel, is located in a posh South Delhi colony having restaurants & bars, bakery, Mughlai restaurants & all those facilities which a perfect hotel should have. Cuisine : Continental, Chinese, Indian. Dining : Restaurants - 4, Bar - 2. Other Facilities : Room Service, H/C running water, Telephone, T.V., Channel Music, Banquet & Conference Facilities, Shopping Arcade, Health Club, Ayurvedic Massage. Address : New Friends Colony , New Delhi - 110 065. A majestic red Jaipur stone creation lavishly spread over acres of lush greenery, Hotel Centaur is just a few minutes away from both the Domestic and the International Airports, making it an ideal stopover point for International travellers. An exquisitely designed atrium Lobby, glass paneled elevators, 376 elegantly done-up rooms and suites and of course the reputed Centaur cuisine, make it a good choice for a satisfying luxury stay. Location : 1 km. from IGI Airport, 22 kms. from New Delhi Railway Station, 20 kms. from Connaught Place. Other Facilities : 24 hrs. Room Service, Direct dial Telephone, T.V., Channel Music, Minifridge, Banquet & Conference facilities, Beauty Salon, Barber Shop, Secretarial services, Shopping Arcade. Address : Indira Gandhi International Airport, New Delhi - 110 037. Situated in the 'green heart' of India's capital city, Hotel Radisson New Delhi is committed to serving and anticipating the needs of its guests. 'Commitment to excellence' is the philosophy of Radisson Hotels & Resorts worldwide with a constant focus on enhancing service standards and endorsing meet not only our guest's expectations but also surprise and delight them. Radisson New Delhi represents the culture and traditions of India. This subtle alliance of consistency and individuality gives our hotel its own distinctive personality. Banquet & Conference : Hall - 4. Cuisine : Continental, Chinese, Indian, Italian. Other Facilities : Room service, H/C running water, Telephone, T.V., Channel music, Banquet & Conference facilities. Address : Natioal Highway 8, New Delhi - 110 037. The Grand hotel with world-class facilities located within 10 acres of landscaped gardens in an environmentally protected area. Only a short drive from the city's business centers and conveniently close to the international and domestic airports. Location : 8 Kms. From I.g.i. Airport, 18 Kms. From New Delhi Railway Station, 20 Kms. From I.s.b.t. Cuisine : Indian, European, Japanese, Continental. Other Facilities : Room Safe, Spa and Single Malt Whiskies served at the Whiskey Bar. Address : District Centre, Saket, New Delhi - 110 017. 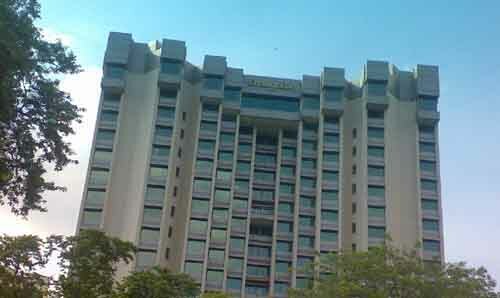 Marriott WelcomHotel is located in an up-market residential area of South Delhi opposite the Sports Complex, Saket. The most recent hotel property to be opened in New Delhi, Marriott WelcomHotel offers the best in international hospitality sectors with all the modern amenities, business facilities, and dining. Location : 18 kms. from Indira Gandhi Intl. Airport, 15 kms. from New Delhi Railway Station. Cuisine : Indian, Continental, Thai, Chinese, South Indian, Western. Other Facilities : Tea/Coffee maker, Hair dryer, Electronic Safes, Two line telephone, Complimentary mineral water in all rooms, State of the art Health club, 24 hrs. Business Centre and Meeting Room.